Can I have multiple lines in a label in Grapher? Sample data with X, Y, and label columns. The same sample data with X, Y, and label columns. The last label has the \n designator, to indicate a new line. 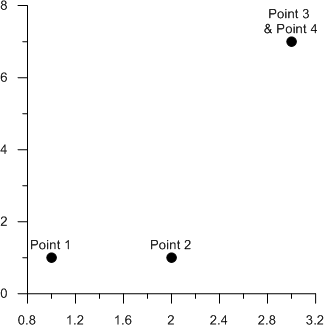 Highlight columns A and B and click the Home | New Graph | Basic | Scatter Plot command ( ). Click on the scatter plot layer in the Object Manager to select it. In the Property Manager, click on the Labels tab. Change the Label variable to Column C: Label. The above instructions viewed in the Object Manager and Property Manager. The scatter plot is created with the label spanning multiple lines.